As we bring the WoPo poem a day writing challenge to a close this year, the team here hope that you have found the writing prompts and suggestions helpful. The archive is always here if you need a little help through out the rest of the year. So what do you do with the poems now? Well… now the work begins – it is editing time! Take a look over what you had e written, are you going to keep it all or only a fraction – do not throw anything away initially but file it else where for a while. Sometimes poems become something only when we forget their origins. What ever the destination for your poems – be proud of yourselves for having come through this journey of poetic madness with us here at WoPo. There is one week left of the WoPo poem a day writing challenge! Do not despair if you are no where near your target of a poem a day – for now is the time for one last push! Get writing, be serious about the writing, feel the looming dead line and WRITE! WRITE! WRITE! If you have already completed the challenge then do not give up – either continue to write or in the writing time that you have been using begin the editing process, smoothing and honing those poems to perfection. You can see the finish line now – so don’t give up and push onwards to victory! So it is time to get writing and creative – so sharpen pencils, crack open the new ink, power up or awaken those devices and write! The idea is that from now until the end of the month you set a side some time to write… each and everyday. Sometimes this isn’t so easy and that is where strategy comes in – write smart! Record voice memos on your phone, jot things down in pocket note books and take some sort of device/pad with you to do so – you’ll be amazed at what can happen during a coffee break at work, or whilst stuck at the train platform. This doesn’t mean you have to write all ideas down as soon as they strike, some people like to mull ideas and let them merge and split and take shape in their mind before ever setting them down in words. If you are such a person, or even if you are not and you just didn’t get a chance during the day, then the bedtime recap could be the thing! Take the notepad/phone etc. to bed with you (warning insomniacs this might not be brilliant for your sleep patterns but is often a very creative time!). Now on this first day make sure you have your writing supplies set and that you peruse the various writing exercises in the archive, more will be appearing during the month but it’s always nice to have a rummage through some of the old stuff! Well what are you waiting for? Go get writing! The first week of our poem a day writing challenge is over! That it you survived it and better yet live to poem the tale! So how did you find it? Easy? Hard? Impossible? However productive you have been the important thing is to keep going – if you have fallen behind then this is your chance to catch up and if you are streaking ahead – then lets break some records and push new boundaries! And remember there are plenty of writing exercises both shiny new ones and in the archive, plus inspirational pieces by our guest bloggers. Idea have a habit of breeding more ideas, this can be brilliant and make you really productive or it can de-rail the writing process and you simple have too many ideas and fail to take any to completion. A way around this is write an idea spiral – draw a light spiral in pencil on a piece of paper and then starting in the middle start writing down your ideas. If there is just one then it can sit there and await for more ideas to turn up but if there are lots then keep writing them down. Once the spiral is full surround it by four other pieces of paper and analyse the ideas. Are they all different ideas, or connected? Sometimes things seem like lots of ideas but are pretty much just the core different stanzas for the same poem. Group the ideas on one of the four sheets, list them in priority order that you would like to write them in on the other. If they are a large sequence or set then set out all the interconnections and relationships on the third piece of paper. The last piece is for anything else that might occur to you. If you have no other ideas or current projects then now would be the time to add another four pieces of paper to the corners to make a large square. Pick one of the ideas, preferably the one you listed as top priority, and create word web, what associations does the theme or concept have? On the second piece, write down bullet points of related concepts. If you wish it to be a structured poem then on the third piece of paper create a structured outline to shape the finished poem to. The fourth piece is for you to actually write the poem. Once that poem is written you can remove the four corner pieces of paper and put fresh ones in place and do the same for the second idea. If you have lots and lots of ideas it might be a good idea to just create the initial spirals to get the ideas off your chest or out of your brain. Then place these spirals in a folder for looking at later on after you’ve completed what ever the current writing goal is! Weekends (or when ever your days off are) are valuable, if you are not a full time writer then weekends are often the golden time for writing. Set some solid chunks of time aside, preferable an hour or so. If you have weekend commitments such as kids or clubs then think carefully about exactly where and how the writing will fit in. It maybe that you get up at your normal week/work day time and write whilst everybody else is having that lay in or it maybe that you have to take a note pad and pen to the gym and scribble notes whilst on the exercise bike or over a lazy coffee whilst the kids are in what ever sports club they are attending. What ever you time table make sure you have scheduled time to write. If you happen to be lucky and have lots and lots of writing time then make the weekend different! If you write free verse then take weekends as time to work on rhyme, start by reading some rhyming poetry, get the rhythms and different rhymes schemes hooked in your brain. What ever you are doing… WRITE WRITE WRITE!!!! I am Sarah L Dixon, also known as The Quiet Compere. Why did I make Cheltenham the Finale of the tour? Four years ago I knew very little about Cheltenham and had never been. Now, even though I have mainly visited in November (for reasons made clear below) I have an image of very white-washed walls and Greek blue sky. It feels like being near the sea to me, even though I am assured, with my sketchy geography, it is about as far away as you can be from the sea when in the UK! Ok. So four years ago I was coming to Cheltenham for a conference about how Art and Medicine interact (more about that below). I decided I would run a poetry event there, despite knowing no-one in the area and started making friends there through social media. I booked a venue and ten poets and this was the first event I ran outside Manchester (I had no idea this event would be the beginning of a path that led me to 2 12 date tours in 2014 and 2015). This first event away from home did not come without its challenges. The venue I had booked closed down about three weeks before the date. Determined that this would only be a hurdle and not flatten it I asked around and Adam Horowitz (one of the performers) suggested a space called Meantime Art Space and I contacted Sarah and she was a superstar, spoke with the person whose art was displayed, sorted out some beers for the night and even took me for noodles when I arrived making my first impression on both Cheltenham and my first impression of a noodle bar positive. I had a buzz that lasted days when the night went well, poets turned up, I met poets I had only seen online and all stuck to time limits and were friendly. Each year I have run an event the night before Medicine Unboxed. I am still searching for the perfect venue. The second year it was in the Frog and Fiddle’s Barn, which I am sure is delightful in summer months. It was a bare brick wall space with high ceilings, a stage and PA system. On a cold November night it felt like being in a barn. Last year I ran a medical-themed poetry night at The Strand. We had a downstairs room and thankfully a mic (as the party in the bar was particularly rowdy and we were divided only by a curtain). This year we have booked the upstairs space at The Strand as I tread my Cheltenham venues learning curve. After the Cheltenham gig I decided to takeover Poetry by Heart in Leeds for a month with six poets I knew from workshops, Arvon courses, events and Facebook. The gig was cracking. When my job in the NHS was disappeared and I started doing spreadsheets for my neighbour’s company from home between school runs I saw an opportunity. I was fuelled by an Apples an Snakes masterclass presented by Tony Walsh about “How to promote yourself, your poetry, your events” that I has attended two weeks before the job went awry. I had disregarded the section about applying for funding at the time. I am not funny. I am not perfomancey. Why would anyone fund my tour? But then, the tour didn’t have to be about me. What did I do at every event I ran. I quietly planned, promoted and hosted these events with attention to detail that was noted and appreciated by performers and venues. 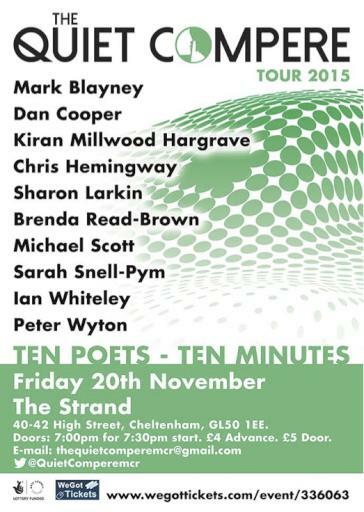 Could I take the ten poets x ten minutes format on tour? I was aware this format had been employed in the North East at Take Ten, but only after it had evolved at my nights as a format that filled a gap in the circuit. Many established nights had 2-4 minute open mic and 15-30 minute guest spots, but not many gave poets the opportunity for something in between. I know I was terrified the first time I had to fill a guest spot with poems (when before all I had 2-3 minutes). The Quiet Compere Tour has been Arts Council funded and has so far been to 23 cities, putting on shows with 10 local poets reading for 10 minutes each. I like to introduce poets only by name rather than huge bibliography. Let the poems do the talking. We have a mix of established and less well known performers, and it’s the latter that often steal the show! Events in Birmingham, Worcester and Oxford have all been hugely successful and I would be delighted to see some of the performers and friends from those areas in the audience. Play. Enjoy. Try different styles. Find other poets you trust. Get feedback. Be honest. Pursue butterflies. Stretch yourself. Try not to over-edit. I worked in NHS admin for 17 years and when I returned from Maternity Leave received a link to a conference called Medicine Unboxed. This is a conference master-minded (he is director and curator) by Samir Guglani, Consultant Clinical Oncologist at Gloucester Hospital. The first year I attended Sam engaged in every debate on the same level as the expert panels, or even more strikingly in one-to-ones. I have now attended the past three years (themes Belief, Voice and Frontiers) This year’s theme is Mortality (and as spent over half of NHS life as a Histopathology and/or Post Mortem secretary) this is of particular interest to me. Samir Guglani was a performer at the Oxford event in May and I met Kiran Millwood Hargrave, who is in the Cheltenham line-up through Medicine Unboxed and Cheltenham Poetry Festival.